The smallest, lightest, most rugged multi-gas detector made. The revolutionary Gas Alert Micro Clip offers full-function multi-gas instrument performance! The smallest, lightest, most rugged multi-gas detector made. The revolutionary Gas Alert Micro Clip offers full-function multi-gas instrument performance, with the simplicity and ease-of-use of a Gas Alert Clip Extreme. The unit is Rugged, ultra-compact (4.2 x 2.4 x 1.4 in / 10.7 x 6.0 x 3.6 cm) and lightweight (5.6 oz. / 160 g) It is easy to use, with simple one-button operation and integrated durable, stainless steel alligator clip. The integral concussion-proof boot makes the Gas Alert Micro Clip perfect for the most rugged environments. Included with every unit is Standard datalogger features (16 hours) and event-logger (10 events). See the option IR (infra-red) connectivity kit to get the data into your PC for reporting. The continuous LCD shows simultaneous gas concentrations for H2S,CO, O2, and combustibles (0-100% LEL or 0-5.0% Methane) Alarming provides 95 dB alarm tone and bright wide-angled alarm bars and has an internal vibrating alarm for high noise areas. LCD Backlight: in alarm (auto) and on demand reactivation. 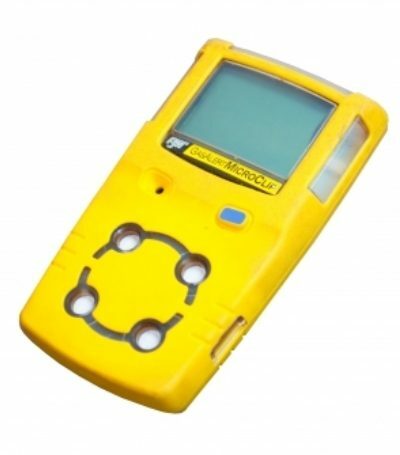 Four alarm levels: Instant Low and High Alarm for all gases; TWA (time weighted average) and STEL (short term exposure limit) for H2S, CO; OL (over limit alarm) Powered by a lithium polymer battery (run-time typically 14 hours; recharge in less than 3 hours).